Tunisia’s Zine Ben Ali: So…will the end be graceful or graceless? End of an Era: Beginning of …something new? The words of John Denver forty years ago in the mouth of Zine Ben Ali today? Is it all coming to an ignonimous end for Tunisia’s president Zine Ben Ali, and his wife Leila Trabelsi? Zine and Leila: Next Stop…Nice? Rome? Cairo? Miami? Buenos Aires?Prison? almost over for Tunisia’s first couple, that they are emptying out what is left in Tunisia’s coffers, that an airbus is fueled, ready and waiting to take off, as are the private jets of members of their two extended families… just in case the protests rocking the country cannot be crushed. As the protests spread, Ben Ali’s grip on power appears to be fading. Are we looking at the final hours, days of Ben Ali’s long 23 year `reign’ in which human rights violations have become so commonplace that they have hardly attracted attention until, this last week, it all reached another level? If these ongoing riots would trigger social unrest that spreads out to others regions, it can definitely imply the downfall of the Regime . But so far, there are not enough indications to be certain of anything yet . 1- What if the SidiBouzid unrest gets bigger and wider, and reaches its “Point of No Return” ? 2- Finally, what will be the Regime’s response ? the money &amp; run !!! Although things can turn nasty if the Police Forces are given the order of cracking down on any protest . That would be real foolish, should the order be given because this will only add more aggravation to the general situation where Tunisia finds itself today, namely in the middle of nowhere . The country needs badly to get rid of this corrupt political system, and must plead for a peaceful “Takeover” in order not to lose grip over its stability . In other words, no one will ever gain anything from a bloody civil war, and the Regime must bear that in mind before it’s too late. Dr. Marzouki a dit: “…Ce n’est même pas une dictature idéologique, c’est une dictature mafieuse…”. Une dictature idéologique serait plus résiliente, la dictature de Ben Ali est plu fragile et ne durera pas longtemps…..Les hommes honnêtes de la Tunisie même qui sont au sein du pouvoir doivent agir maintenant ! (note: there is a Dr. Marzouki, I am not sure if he is the same one, who has long been a leader, spokeperson for improving the human rights situation in Tunisia). 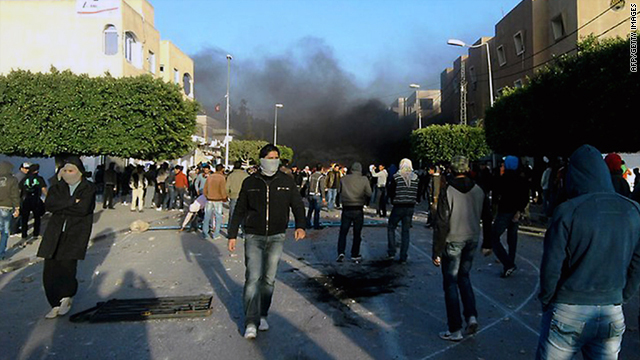 Meanwhile, the protests which started nine days ago deep in Tunisia’s interior continue. For a moment it appeared the protests would die down, but instead they re-ignited throughout the Tunisian interior, including in Kairouan, Gafsa, Redeyef, Meknassy, Bouzayane and have been going on for more than a week now. In many places these became violent clashes between what seems to be Tunisia’s youth, much of which is both educated and unemployed and the authorities. Where will the cataclysm of violence the country is experience end? According to a communiqué issued by the Tunisian Press Agency (TAP) the Tunisian Interior Ministry affirmed that the locomotive of a train and three national guard vehicles were also set on fire and that the national guard headquarters in the same town Menzel Bouzayene was overwhelmed by protestors forcing the defenders to respond with live ammunition. Back in Sidi Bouzid, another unemployed university graduate, in an act of solidarity with Mohammed Bouazizi, electrocuted himself by reaching out to a 30,000 volt electric line on top of a lamp post. Below was a large crowd protesting unemployment in front of the offices of the Tunisian trade union federation UGTT. As the protests and confrontation spread, the local police and national guard could no longer contain the situation and in several cases, the Tunisian army was brought in an attempt to keep both the news of the protests, and the protests themselves, from spreading nationwide. News of the disturbances, which began on social networks like Facebook and Twitter, have also spilled into the European media, this despite the fact that, given Tunisia’s status as a `friendly police state’, as one commentator calls it, it often escapes the human rights scrutiny reserved for countries like Iran or China. But now we’re beyond that and stories about the Tunisian events are popping up worldwide. I imagine, after demonstrations planned for today in the capital, Tunis (December 27, 2010), more media coverage is in the offing. The speed, the intensity, nay, the violence of the protests, the number of young Tunisians willing to commit suicide or face down the police shooting live ammunition rather than face a bleak future, caught the government of Zine Ben Ali in Tunis off guard. At first there was no response. Then the government claimed the protests were isolated incidents orchestrated by a cynical and unappreciative opposition. But a week into the protests, their tune has changed to a more sober one, trying to sympathize with the victims (at least the unemployed university graduates) and promising economic reform and jobs programs with a government representative sent to Sidi Bouzid to promise such changes in the future. More or less the same promises were made after the people in Tunisia’s phosphate mining district, centered around the town of Redeyef, erupted in a six month on-going social protest marathon against unemployment and deteriorating social conditions in 2008. That resulted in massive government repression and promises of economic development which did not materialize. More and more it appears that the Tunisian government’s response this time is `too little too late’. The image of young, educated Tunisians preferring death by fire seems to have shattered what little credibility Zine Ben Ali’s government had left. A small country – both in terms of geography and population – cannot sustain this kind of anger from its population for very long. And a week of protests, even violent ones, might not sound like much to outsiders, but it easily be the blow that brings down the regime. Tunisia’s `economic miracle’ has long been somewhat inflated. Even in the best of times, the coastal cities and the north benefited more than the interior and the south. It is from the latter that, if one looks closely, one will see that wave after wave of protest against unemployment and poverty have emanated. Indeed, the current dyamic, of a social movement emerging from deep in the interior, is nothing new to modern Tunisian history. Add to this an increasingly corrupt ruling circle in which economic and political power have concentrated more and more in the hands of two families – those of the president – the Ben Alis, and his wife, the Trabelsis…and another important layer of the crisis unfolds. Combine the economic and social disparities, the corruption and excesses of the ruling clans with what has become one of the more repressive regimes politically in the region and the ingredients for a full blown crisis fall into place that only needed a match, lit by a poor soul in Sidi Bouzid, sole supporter of his family, to ignite the desert fire. Before these protests, Tunisians were wondering who, in the near future would replace Zine Ben Ali as he is `eased’ from power – his wife, Leila Trabelsi, a son? Some one else from his wife’s side of the family. With this week’s turmoil, the discussion has shifted some: Tunisians are already talking about Zine Ben Ali as if he is already history and debating, theorizing what/who will come next. Of course it is still quite possible that Ben Ali will unleash his military full force on the entire population and will crush this uprising in blood. There is also the possibility that there is a limit to the Tunisian arm firing on their own people and the military itself could `snap’ and turn on the president. Repression on a broad scale at this point will only hasten Ben Ali’s demise. My own speculation is that the Ben Ali’s-Trabelsis will follow a path well warn by others – by Marcos, Mobutu, the Shah of Iran and join the Third World Kleptomanic Hall of Fame – and, that they will, after looting Tunisia one last time, make their exist from Tunis to …wherever. 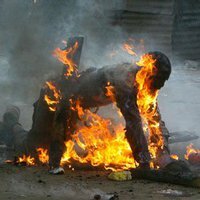 Things have gotten too hot for them, the social base supporting the regime has become so razor thin narrow, that even if the families survive the current social uprising, that their days are numbered and they know it. Even dictators need some base of support within the population and one has to be hard pressed to find Ben Ali’s. modest in terms of more far reaching socio-economic directions? How would a new administration `cooperate’ with Washington in its `war on terrorism’, plans to expand Africom, etc.? And what will follow for Tunisia, a country that 64 years ago gained its independence (from colonialism) but not its freedom? ” he ain’t a gazelle to be gracious. he is a mule son of a donkey awkward and clamsy. george bush little lecture wasn’t headed. thick hides and brainles can’t comprehend how to be graceful. hi, the name of the first lady is LEILA not LEINA thank you. thanks hank huley…made the changes. Thank you again for your concern, and thank you for taking part in the discussion . Tonight’s short speech delivered to all tunisians by the president, sent a clear signal . He is not backing off . He might as well make use of one of his old tricks that owed him name and fame . He will go on the offensive and seeks direct confrontation . It payed off before, back in the days ! He’s got a lot to lose now, “so why not give it a try ? “, his advisors may have recommended . The 20 sentences he spoke out tonight, disrupted halfway unexpectedly by the ringing of the house phone in the background, said a great deal about his uneasiness . He’s not willing to give in without a fight, but he should be aware that he might end up wanted by the U.N.International Court for ethnic cleansing . That ‘ ll be the day ! It would be much easier for him to surrender to the will of the People, instead of seeking a showdown which he will bitterly regret, if the old fox’s trick fails to pay off this time . Yes… what you write `kerym’ seems to ring true. It suggests even more difficult days ahead, with a wave of repression about to be unleashed in Tunisia – even worse than what we have witnessed to date, meant to crush the protests. I’m not so sure if the Police will walk into the trap . Many of them must share the feelings of the protesters, and when push comes to shove, they may have to put themselves to the test , and ask themselves the obvious question : “why do I have to do this ? What for ? for whom ? ” . When ceaucescu ordered the army to intervene, his orders weren’t carried out despite his firm belief he won’t be let down, but the army didn’t move an inch . The amazing thing about it, is that he couldn’t do a thing about it either ! Not a thing ! There he stood, powerless, and then he suddenly realizes it’s the end of the game . Yes, it was a sad end . again…very interesting comments kerym which i appreciate.. keep wondering about the police and the army and how they will react as well as other social forces with a base inside the country (trade unions, student groups, religious institutions). that is the unknown factor and i guess we’ll see rather soon. and i hope it is more like rumania at christmas in 1989 – how vividly i remember the ceaucescu’s last days. timosaura and then …the end, rather than iran in 2009. part of the problem is simply not knowing what is going on inside the country at this moment, how the different social forces inside tunisia – those that have a base – see the situation and what they are doing and if they have the strength to stand up to the repression. Today december 28th a young man Ayman Miry has attempted to set himself on fire in front of city hall of Sidi Ali Ben Aoun over unemployment and poverty, no reports of his death. Redeyef in the south had a long protests over the night upon witch at least 2 activist are confirmed in prison. Today Gafsa had a massive protest that is still ongoing as we speak and we have confirmed reports that the army is moving in on these protests and helping the police resulting on several injured. Other cities involved in the uprising include Sfax, Gasserine, Mitlawi, Gabes and in the capital Tunis crowd has gathered despite the brutal police retaliation and marched in front of the workers union square. On the island of kerkenna the fisherman’s annual festival has turned into a protest in support of the ongoing unemployment and poverty uprising in the center of the country. So far so good , keyword is Mobilization and the only thing the country needs right now is mobilization on a wide range . This should make Ben Ali think twice . To my belief, the protesters who took to the streets, they mean business despite knowing exactly what kind of treatment they’ll face when caught or arrested . Their motive is stronger than the fear of being molested, emprisoned or tortured . Soon we ‘ll find out whether the police force will be foolish enough to get carried away, or whether Ben Ali will ever come to his senses and admits his failure on social economic policies, leaving unemployment to its fate, and neglected it completely for decades on end . So what you’ve got here, is a desperate situation whereby tens of thousands of graduates who suppose to find work right after they finish study, end up selling vegetables on a market square, referring to the late Bouazizi . And you wonder why the president has only moved now, to launch a financial emergency plan to all these regions in need, but the sum of $5 Billion he’s offering, is just too little and too late . Note it’s chickenfeed . It’s a typical short term measure, good for nothing . Chances are, that the tables may be turned during the process, if the national cohesion remains all along intact, come what may . Our sincere hope that the police & the Army eventually join the people’s side, with minimun on casualties . This should be the safest platform from which the leap can be made to real democratic reforms, real democratic elections with multiple candidates . Last but not least, bringing to justice members of the old guard through judicial hearings . It’s essential for tunisians to draw a historic lesson from the ugliness of dictatorship regimes, such as this one . Tunisia is not so important to the US economically, and its influence on Arab/N. African politics is – if you’ll excuse me – rather light. but..
2. the US look at virtually everything in the Middle East – now defined as from w. morocco to e. pakistan and e. afghanistan within the framework of its never-ending war on terrorism. ben ali might be `a skunk’ but he cooperates with the US in NATO, AFRICOM projects and thus he’s `our skunk’. there is also tension, not unusual, between the State Department which, I am convinced is well aware of Ben Ali’s sorry record, and the Defense Department whose first interests is maintaining the strategic balance of power throughout the region… we might have state department cable leaks; we don’t and i believe won’t have leaks from the defense department… but i think they hold most of the marbles concerning US policy towards tunisia..the defense establishment has not yet abandoned ben ali. 3. all this raises another hypothetical issue… let us say that the demonstrations, protests, despite the repression, continue and it looks like ben ali’s days are indeed numbered. then the regional question comes into focus — will the US, France, NATO `permit’ the democratization process without interfering militarily. i admit i don’t have the answer to this, but i am rather certain that the Tunisian crisis – for that is what it is – is being discussed at the highest levels in NATO and the USA and that contingency plans are being thrown around. At this stage, the U.S / NATO role would be to continue monitoring the situation, and to make a day-to-day assessment . If Ben Ali begins to lose control, it’s unlikely that the U.S. will come to his rescue . It would seem absurd . I may even add that Whashington would be more than happy to see him go . I don’t think they have any reason to sympathize with him, is my strong belief . Indeed, just like you said, the U.S. can’t afford to do business with Tunisia like it does with the Gulf States, given the fairly low degree of interest for Tunisia on the political thermometer of the Oval Office in Whashington . We do not need to consult the weakileaks pages to know that . Tunisia just happens to figure somewhere at the bottom of the list . Let’s just say that U.S – Tunisian relations remained as they always were, in the absence of real big vital common interests and that’s absolutely no shame . Right now the U.S / NATO concern about the situation in Tunisia,would be the possibility that subversive elements belonging to AQ may infiltrate and build a stronghold, like they did elsewhere . For no reason other than to create more chaos and mayhem . But I must rule out that AQ will ever feel at home in Tunisia ! Thank you again for your contribution to help cover the events, and for your objective analysis , Prof. Rob Prince ! i was telling a friend yesterday that i thought the AQ threat was overblown, that they had no base – or hardly any base – in Tunisia and that it is unlikely that they would, but that ben ali and perhaps the US/France might use `the islamic threat’ as an excuse to stand behind ben ali. i really appreciate these exchanges. help put things into focus. haven’t heard much today other than that a poor young man jumped in front of a train in nabeul, there are still demonstrations in the interior, and that the tunis police were – predictably – very rough on demonstrators there. i intend to write more on this for a number of national blogs (ZNET, Foreign Policy In Focus) but want to wait a bit to get a better sense as to what is happening there and in Washington DC. Yes, the notion of AQ/ “War on Terror” has become a magic tool for politicians to utilize it whenever it suits their own agenda best . Who knows what the days ahead will unfold, and how bad will it get . Should it get from bad to worse, in terms of human casualties, I fear it may escalate further, but it doesn’t necessarily mean That Ben Ali will come out victorious . In fact, it remains to be seen since the people had called his bluff, right when he was busy delivering his speech . I tend to believe that any major Revolution is some kind of a collective state of mind that comes in tune in a moment in Time and ignites spontaneously, but mostly driven merely by discontent and by lack of perspective . In the case of Tunisia, it all started with the one “match” you’ve mentioned in your artical . A single match that sealed Bouazizi’s fate forever, although he’s still at the IC with severe burns, as Ben Ali paid him a visit today . Nonetheless, it may be the liberating match that the country has been waiting for too long . We haven’t had any news today, because today the tunisian Government has banned the use of internet in many regions, to prevent the protesters from uploading new video footage to youtube . Meanwhile a ministerial reshuffle has been made, a PR gesture to make believe that everything is under control . Great article… The only word you missed is “DICTATOR’ and he should be hanged like Saddam. we ‘d rather see him brought to Justice . Not without a fair trial, btw. The People must have the right to reclaim what’s been taken from them during 23 years under his reign . We must not do what the Rumanians did with their tyrant Ceausescu . They couldn’t cope with their emotions, so they executed him on the spot, instead of living the matter to Justice to decide . I, for one, would prefer to see B.Ali arrested, after lifting his presidential immunity, be put in custody at a maximum security prison, and awaits his trial . Actually he must be kept alive at any cost, cos terminating him would not enable us, as a nation, to evaluate the total amount of money he had managed to transfer to different foreign bank accounts, stolen from the national treasury with a certain regularity . By now, it must be an astronomical sum of money that he grabbed . We will be able to make an estimate of the country’s real financial income than to rely on the manipulated figures the regime has been presenting to us and the to World Bank . I may strongly guess, that his wife and a number of his and her relatives might ‘ve left the country . Rest in peace Mohamed Bouazizi! I hope you are at the place we all hope to go to! I truly enjoy studying on this website , it contains superb posts . Thanks! I truly enjoy that.